You cannot use the messages in a scanned PDF document freely. So if you want to edit or modify the content in the scanned PDF document, you’d better convert the scanned PDF to Text document with OCR (Optical Character Recognition) technology first. Then make changes to the created Text document. So you can use Scanned PDF to Text OCR Converter which is a command line application to help you. Scanned PDF to Text OCR Converter is oriented to MS-DOS interface use, and it's free for downloading and evaluation. To obtain the full functions of the application, please buy the server license via clicking here or buy the developer license via clicking here. Before converting scanned PDF to Text document, you should open cmd prompt window by clicking "Start" at left bottom of the desktop and clicking "Run" in start menu. 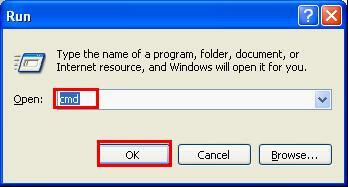 In popup "Run" dialog box you should input "cmd" and click "OK" button. Please see Figure1. Then you will see cmd dialog box comes out. Now you can convert scanned PDF to Text with the application. Just follow the basic command line below to input your command line in cmd dialog box. pdf2txtocr.exe stands for the executable file in Scanned PDF to Text OCR Converter. –ocr means the application will call OCR function. C:\in.pdf stands for the scanned PDF document. C:\out.txt is the output Text document. There is an example command line for your better understanding. Please see it in Figure2. "C:\Documents and Settings\admin\My Documents\Downloads\pdf2txtocrcmd\pdf2txtocr.exe" is the path of pdf2txtocr which is the executable file in Scanned PDF to Text OCR Converter. "-ocr" option is for using OCR technology, which can not be omitted here. "C:\Documents and Settings\admin\Desktop\demo\pdf\test_pdf2excel_ocr.pdf" is the path of scanned PDF document. 01.text is the file name and suffix of new Text document. If you don't specify the path for the target file here, it will be stored in current directory— C:\Documents and Settings\admin by default just like the example. Convert text based PDF files to plain text files. Support user password and owner password in input PDF file. Able to convert color PDF files and color image files to plain Text files. The best OCR application in the market.